The Jordan Valley Pathway is one of the most popular weekend backpacking trips in Michigan’s Lower Peninsula, thanks to its scenery, walk-in campground and the rugged and remote nature of the Jordan Valley. Located north of Mancelona, the 19-mile, two-day pathway is a loop, thus eliminating the need for complicated transportation arrangements, and has enough climbs, especially on the second day, to give anybody a sense of accomplishment. Most of all, the Jordan Valley Pathway is a scenic walk where much of the day is spent either skirting the cedar banks of blue-ribbon trout stream or climbing to overlooks for views of the valley below. 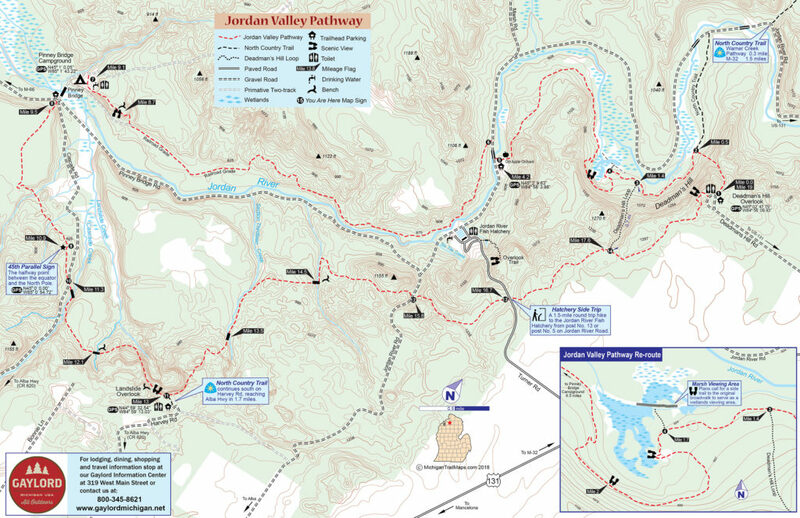 From MichiganTrailMaps.com, your trusted companion for accurate trail information, the second edition of this map is the most detailed and accurate available of the Jordan Valley Pathway. The large format map measures 11 by 17 inches, is printed on durable card stock and is coated to be water resistant. Includes all trail posts, mileage flags, contour lines, even where every bench is located along the trail. Best of all, when folded it fits in your back pocket or the side pouch of your pack.